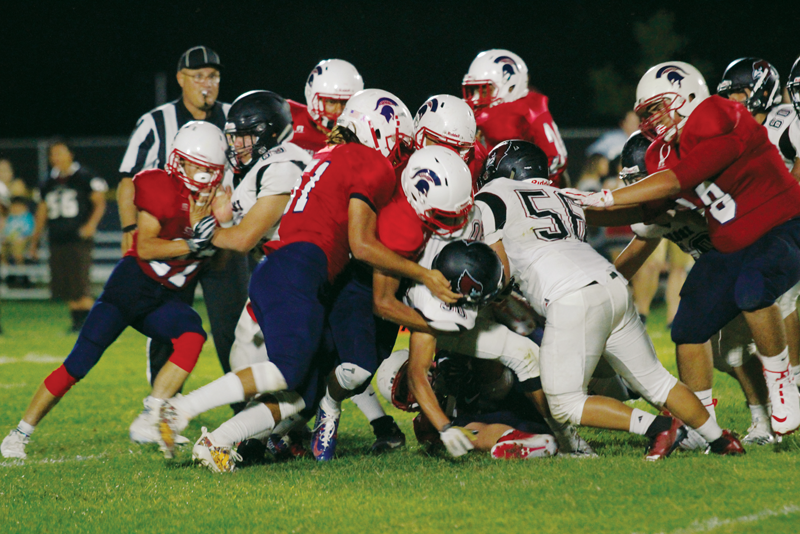 STRATHMORE – Last Friday’s matchup between the Spartans and Orosi Cardinals was supposed to provide offensive fireworks on both sides of the ball with the best two running backs in D-VI. 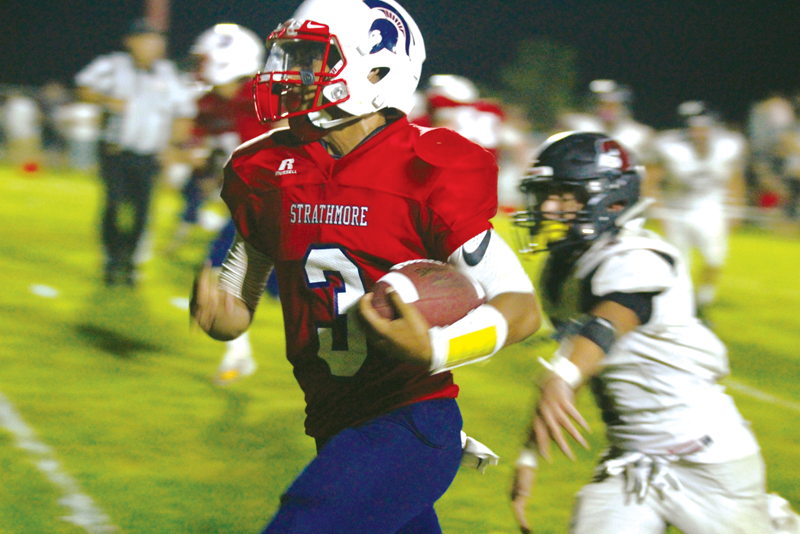 Instead it was Strathmore’s former running back turned quarterback Cristian Rodriguez who stole the show in the fourth quarter of the Spartans’ 27-22 win. The Spartans (3-0) trailed the Cardinals (2-1) 22-21 when they turned the ball over on downs on their own 27 yard line. With less than two minutes left, Orosi could have rushed the ball to force Strathmore to use their timeouts. That is, if they did not lose a fumble on the very first play and give new life to the Spartans. Rodriguez addressed his team in the huddle and challenged them to rise to the occasion. “I told them if we were going to go undefeated, it had to start right here,” Rodriguez said. After a series of long passes and runs Rodriguez brought his offense to the line of scrimmage with only five yards between them and six points. On first and goal he found Lee Navarro across the middle for the go ahead score, but an illegal formation penalty brought the play back. After two more plays Strathmore was still knocking on the door. Then Rodriguez knifed through the defense on a quarterback keeper to put the Spartans on top 27-22 with 17 seconds left in the game. Rodriguez finished the game with an impressive five carries for 30 yards and two touchdowns and connected on eight of 11 passes for 87 yards. The high scoring outcome of the game was held in check by both defenses, but it was the Spartans which made a bigger impact and kept them in contention. Two interceptions by Fabian Alcantar, including one he returned 90 yards to put Strathmore up 7-0, instantly ended a couple of Orosi’s drives. Cristian Rodriguez rushes for his first of two touchdowns. Photo by Patrick Dillon. “We knew he was amazing, and he took command of the defense tonight,” Blackwell said. Alonso Acevedo was supposed to do the scoring for the Spartans. Instead it took him until the third quarter to get into the end zone. On Strathmore’s ensuing drive after Orosi had scored to make it 7-6, Acevedo broke off a 46-yard run. That score widened their lead to 14-6 but at a steep price. Acevedo leaped to celebrate with a teammate and hurt his left knee and did not return to the field. His status is not yet known. Acevedo’s long run gave him 79 total yards on the night. It is the first time since the 2016 D-VI quarterfinals a Spartan tailback has failed to rush for over 100 yards in a game. The Spartans did not help their case by committing 13 penalties for 76 yards. No less than eight of those were procedural penalties such as false starts and illegal formation. One of those penalties called back a potential game winning touchdown when Rodriguez threw for the score. Instead he had to take it in himself two plays later. Strathmore’s winning streak now sits at 19 games and this Friday they will be the first to welcome the Farmersville Aztecs to the East Sequoia League as both teams face each other in Farmersville at 7:30 p.m.